A pilot study called the Warrior Wellness program is shining light on how exercise can help veterans manage PTSD symptoms. In the U.S., November is a month dedicated to the idea of giving thanks. We even have a national holiday to remind us to think about what we’re thankful for, like our family, friends, and loved ones, or our good health and happiness. While Thanksgiving gets a lot of attention, there is another holiday—Veterans Day—reminding us that we have even more to be thankful for: our freedom and those who fought so hard for us to keep it. We owe our gratitude to every active-duty personnel and veteran who served this country and defended our rights—especially as they return with sometimes adverse effects. Post-traumatic stress disorder (PTSD) is one of the more common conditions that affects veterans. According to the National Center for PTSD, the condition affects approximately 7-8% of all Americans, and some sources even estimate that the number of people living with PTSD is much higher, noting that 8-12% of all adults and 13-31% of military veterans may develop PTSD during their lifetime. Fitness facilities across the country are showing their thanks by offering classes and programs designed to help veterans improve their health and manage any chronic conditions they may have developed as a result of their time in the service. For health clubs that wish to help veterans with PTSD, there’s a great deal to be learned from a recent study conducted in North Carolina. Under the leadership of Katherine Hall, Ph.D.—a research health scientist at the Durham VA Health Care System in North Carolina—one gym in Durham, NC, recently created a pilot study to determine how increasing amounts of exercise can help older veterans manage PTSD symptoms. The Warrior Wellness program was a 12-week exercise plan that focused on four targeted areas that form the basis for good health—strength, flexibility, balance, and endurance training. The program is unique because it was tailored to suit the needs of veterans who have PTSD and included components that emphasized peer support, exercise supervision, and repetition. The program’s comprehensive list of exercises could also be modified for any individual struggling with muscular ailments. Fifty-four older veterans, at least 60 years old, diagnosed with PTSD participated in the pilot program—which concluded this summer. Of the 54 participants, two-thirds were randomized to the Warrior Wellness program, and the remaining third was randomized to an existing Veterans Affairs wellness program of their choice. The majority of participants were men. Warrior Wellness participants attended three classes per week for 90 minutes or less, taught by trained exercise physiologists. 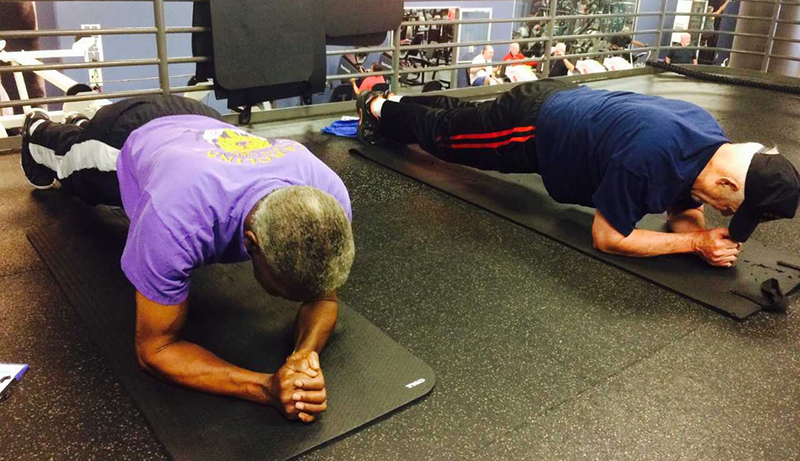 Between four and 10 veterans worked out at the same time and received personalized guidance from instructors. As the program progressed, exercise intensity and the amount of guidance provided varied. Usually, for the first two weeks, veterans received personalized guidance from instructors to learn how to properly perform different moves and perfect breathing techniques. After that time, participants were encouraged to work independently for the remaining 10 weeks. At the end of the 12-week program, participants completed a checklist that measured changes in PTSD symptoms, physical function, and cardiovascular endurance. Participants in the Warrior Wellness program do planks. The results indicated that many participants felt happier and healthier while taking part in the program. Now, Hall plans to take a closer look at how increasing exercise can have a noticeable, positive impact on specific PTSD symptoms, like depression and irritability. The results indicated that many participants felt happier and healthier while taking part in the program. These additional benefits become even more critical when we consider the age of someone who is experiencing and managing PTSD symptoms. In an article on the U.S. Department of Affairs’ website, Hall mentions why it’s important to specifically focus on the older generation of veterans for a number of reasons. “If we acknowledge that for many of those who suffer PTSD it’s a chronic condition that people live with for decades, then we need to consider its impact in the context of aging. Older veterans with PTSD are showing up on our door more deconditioned and more frail than older veterans without PTSD, largely due to a lack of exercise. While there are efforts targeting younger veterans of more recent conflicts, health promotion programs that address the physical and psychological needs of older veterans continue to lag behind,” she said. Various studies show that exercise has a number of positive benefits for those that are managing chronic conditions, like PTSD. In short, regular physical activity has been proven to help boost mood, improve cognitive abilities, improve sleep quality, increase energy levels, promote weight loss, and so much more. 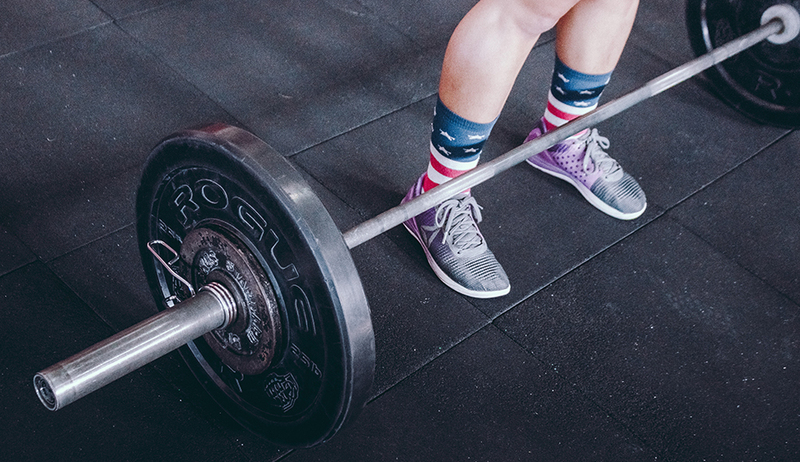 Though there is more research that needs to be done on the benefits of exercise for veterans managing PTSD symptoms, health clubs provide the perfect space and a close-knit community for veterans to work on improving their health at their own pace. Learn strategies to connect with local health professionals and grow your medical wellness programs. Here are five questions you can ask yourself to see how your facility can become more welcoming for different types of special populations. Make your club attractive and effective for one of the fastest growing member groups—older adults.